I try to eat the best foods I can, but once in a while I crave what I consider junk. NOTE: #FoodPorn contained in this message. Take 15 - 20 minutes to make them today. I make music, but I also LOVE, LOVE, LOVE to cook. This post is for all of you pickle lovers out there. Come on... Some of you love nothing more than a good, crisp pickle. Admit it. It's ok. If your new years resolution was to be healthier and save money, here's your chance to eat something you love thats healthy and actually save some money too! You can have your pickle your way. Don't be afraid. If you're into those everyday cucumber pickles we all know and love, you'll want to try this. 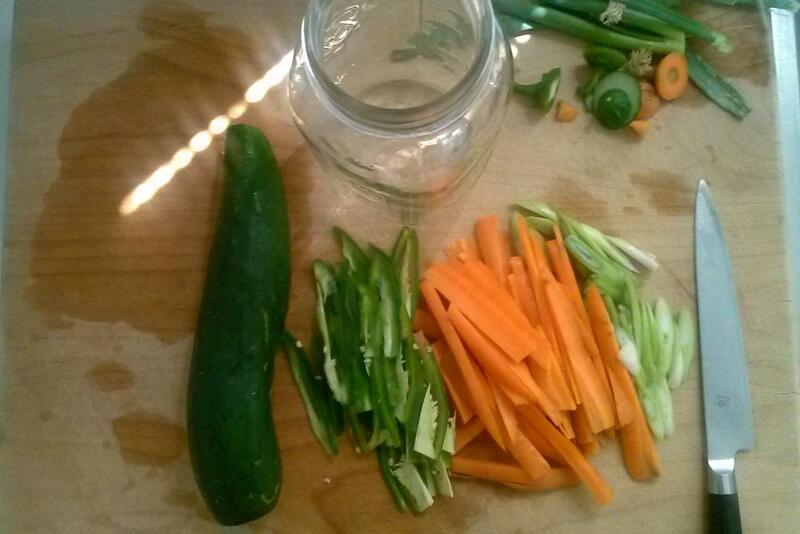 You might discover your home pickles will out perform those supermarket jars for a fraction of the cost (possibly). Here is the recipe for basic quick pickles (glance to the right). For those with more adventurous tongues, there is a vast array of options, shapes, colors and sizes... not to mention peppers and spices. Why pickle mere cucumbers when jicima makes a nice, crispy treat? I love a little spice in my life. Why not add some chopped hot peppers of any kind (jalapeno, habenero, thai chili's, etc.). In the image above you see what I'm woking with. I often add sliced jalapeños, big chunks of onion, garlic, habaneros and a wide variety of spices. I love to experiment and the possibilities are endless. These pickles can be used in so many ways. You can use them to liven up your salads, pr perhaps as a side for your favorite sandwich... These could be the perfect pickles for your burger. You can also chop them up and make an interesting relish. OR... You can do what most of us do and just eat them right out of the jar!! Pack the cucumber slices into the jar along with any optional fresh spices, peppercorns and/or other seeds mentioned. In a bowl, combine liquids, salt and sugar and mix thoroughly. Ensure that everything is completely dissolved. Add the liquid to the jar, seal and refrigerate. You should be able to eat the pickles the next day. Some suggest you wait a week for everything to get "balanced". They will last for about 30 days. Most recipes I found online suggested one bring the liquids, salt and sugar to a boil in a pot and mix thoroughly. Why boil the liquid? To ensure the salt and sugar dissolve. I really don't boil my ingredients in a pot. Instead I boil water and measure 1/4 of a cup. I add the 1/4 cup of hot water to the bowl of sugar and salt and mix well. If I need more water, I measure another 1/4 cup and mix. Once everything is dissolved I add the remaining amount of water, mix and pour the solution into my jar of raw ingredients. Why do I do this? Well... I don't want to cook or heat up my raw cucumbers or carrots, do I? NO. I sometimes add raw herbs to my pickles.. Maybe some dill, etc... but I often fear they'll get mushy if they sit in the fridge for many days.